This Christmas I wanted to get an early jump on holiday decorating. I couldn’t find an outdoor wreath that I liked and truly did not want to pay $30 on up for one that I would be tired of looking at after the season wraps. I love the look of a live wreath and looked around the garden for inspiration. The camellia bush was bountiful and ready to bud, and the holly bush was already red with berries. Time to use what I have. Here we go. 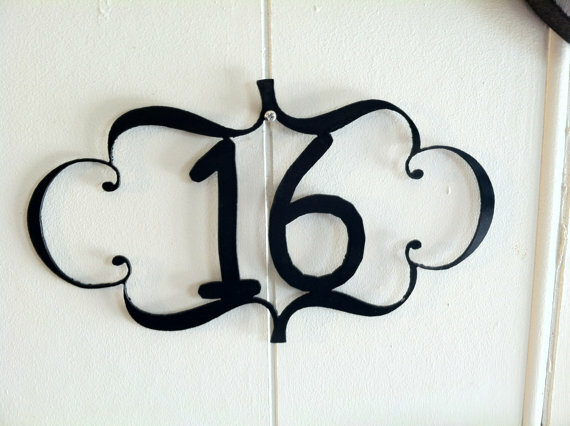 • Use your discount coupon for Michaels or Joann Fabrics and buy a metal wreath frame. • Cut camellia branches with buds attached and cover the entire frame. Secure branches from the back with green twine or floral wire. Make sure the raw ends of the wire are tucked in so they will not scratch the surface of your door or wall. 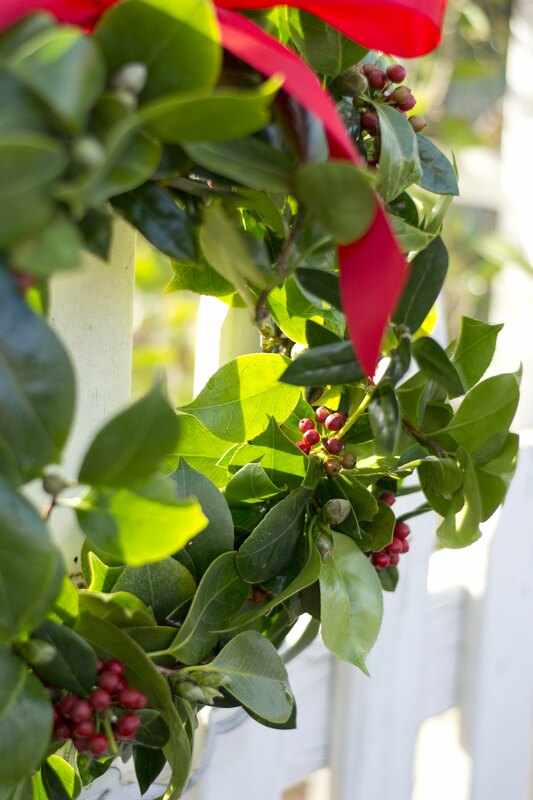 • Cut holly berries and secure them between the camellia leaves. 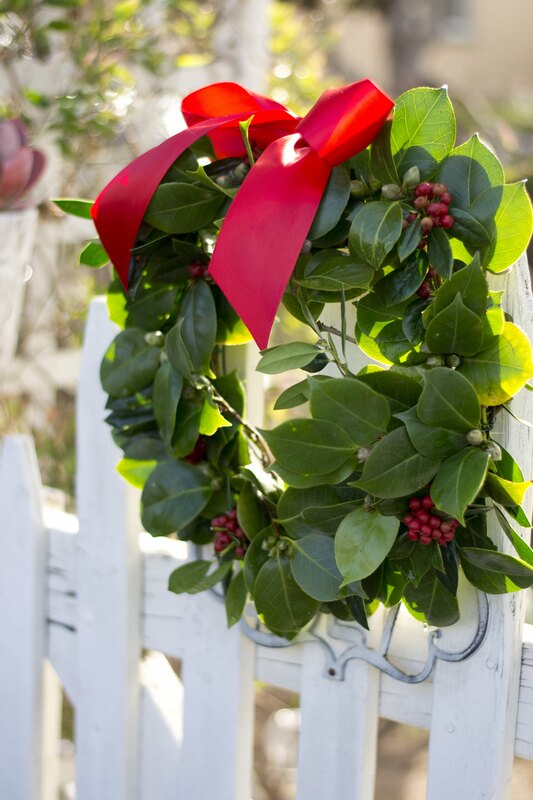 • If hanging outside in the sun, make sure and water your wreath daily or every other day. I take the hose and give it a spritz of water from the back. So far it still looks fresh. • If the wreath starts to fade before Christmas, it is easy enough to add more berries or swap out the browning leaves. • It takes a lot of branches and greenery to cover a small 12″ wreath so make sure you choose a plant in the garden that is overgrown and won’t suffer from a little trim. Just like my friend, Tom, I dreaded having to paint a large, plain wood fence in the back alley of my cottage. 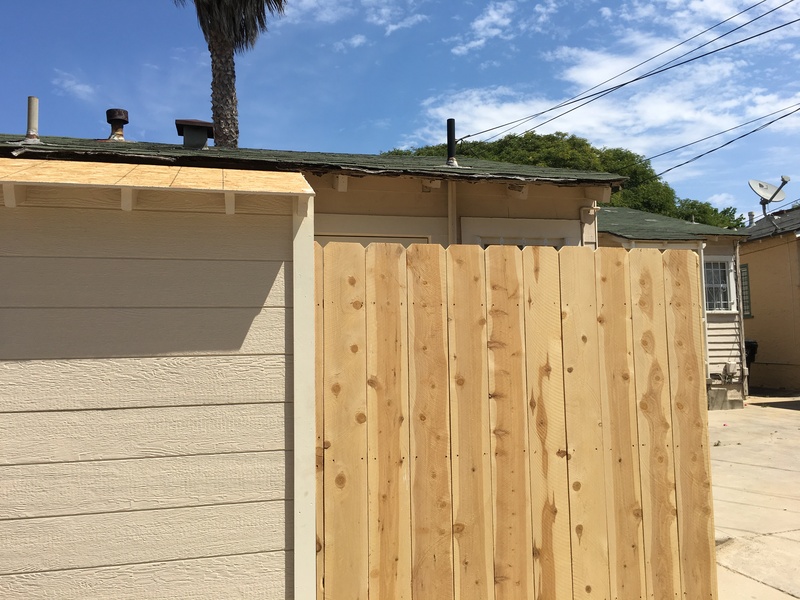 The fence was extended and repaired to include a privacy gate. Old sections that became dinner for termites (a big problem by the coast) were swapped out, leaving an unsightly hodgepodge of new and old planks of wood. But unlike Tom, white washing turned out to be an easy fix, and I didn’t have to trick anyone into helping me paint. I had Minwax white wash pickling stain left over from a previous project. And I knew it looked clean and fresh on unfinished pine wood. Another advantage: no priming necessary! • Although the stain is not recommended for outdoor use, it is actually quite durable in a mild climate like Southern California. Instead of brushing on the stain and then immediately wiping it off with a cloth (as per the can’s directions), brush on a thin layer, don’t wipe and let dry. 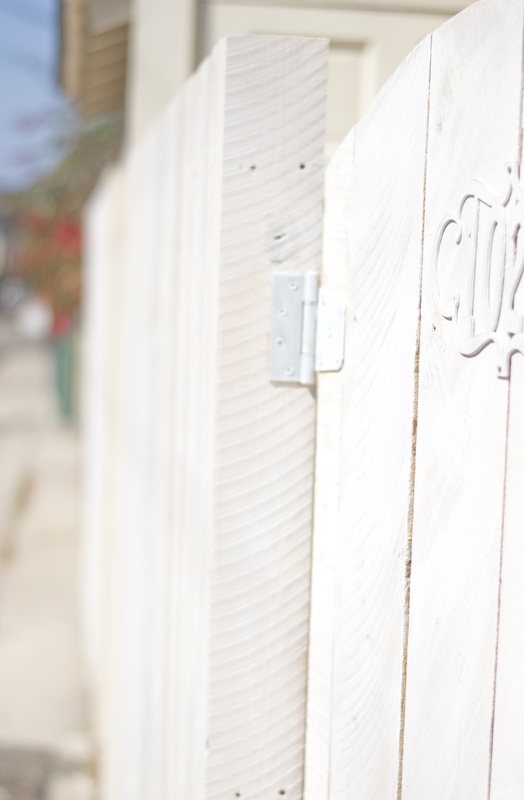 The unfinished wood will absorb the stain unevenly and that adds to the charm of a white-washed fence. • Use a brush not a roller. You want to see some of those brush strokes. 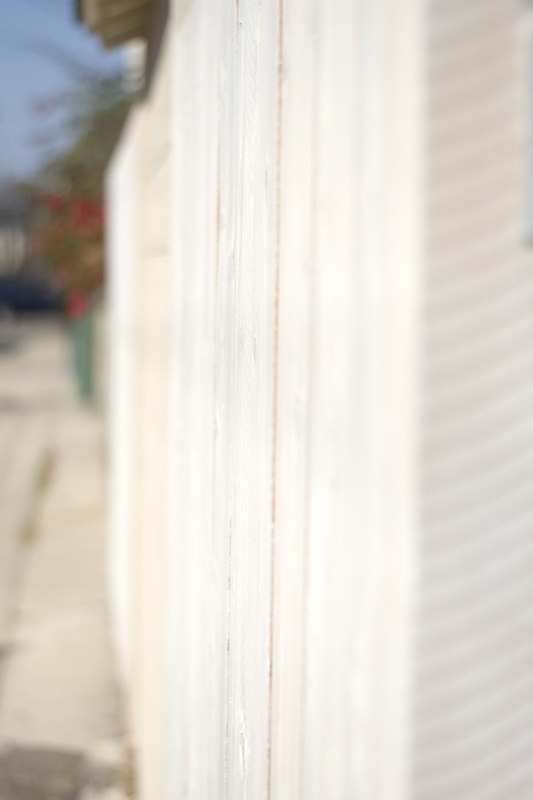 Occasionally paint against the grain of the wood here and there to enhance the shabby yet chic look of a white-washed cottage fence. • You can stain a fence in half the time it takes to paint it. The stain also helps to protect the wood over time. 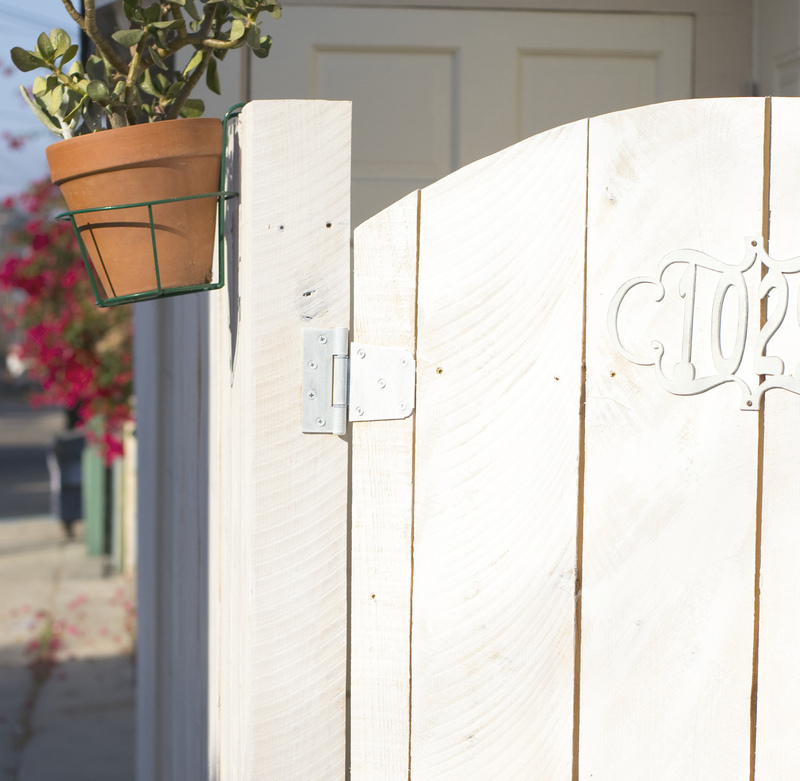 Here’s a bonus tip on how to hang a unique planter on a garden fence. My love and awe of succulents continues. Now that my succulent bouquet in a cement-covered dollar store urn has been thriving, this girl born with a brown thumb was starting to feel confident. I wanted to hang a unique planter to a new garden gate that wraps around my cottage. My flower boxes always end up looking a little faded, so low-maintenance succulents in a vintage postal box was the way to go. 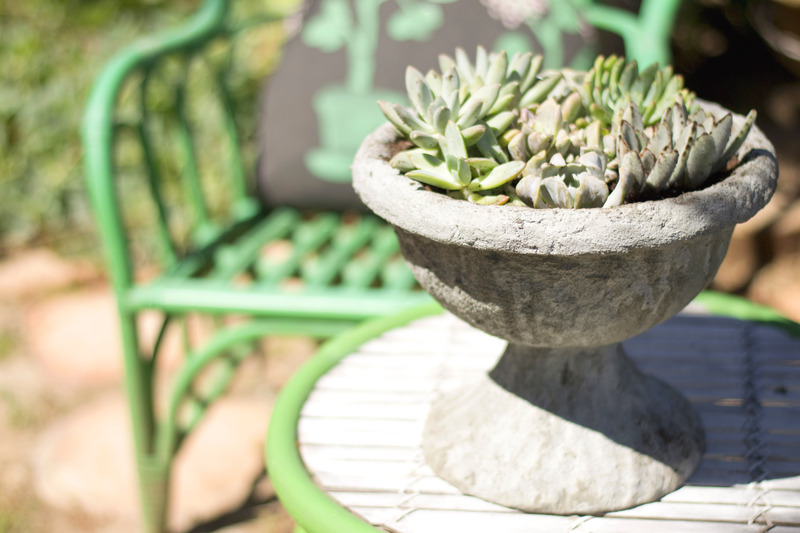 Because succulents have a shallow root system, they don’t need a lot of soil to grow. Succulents have no problem squeezing into a small, narrow vintage postal box, and I was lucky enough to find one close to home. One of my favorite places to find vintage treasures is the Newport Avenue Antique Center in Ocean Beach, California. On my first day of the hunt, I found a small cast iron mail box from the 1940s, which was 40% off. It was already painted a dark French green, perfectly matched to the shutters on the front of the house. Because it is made for the outdoors, I didn’t have to worry about rust and it not holding up in harsh weather. 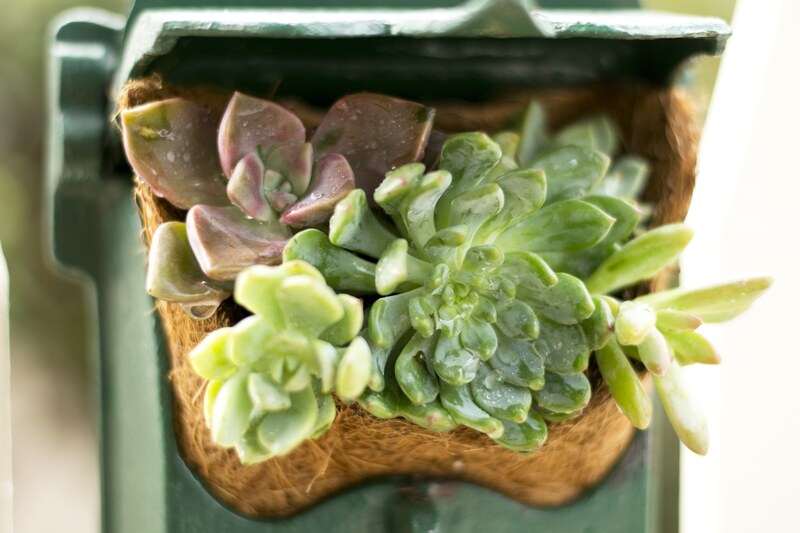 Cut a coco plant liner to form a cone that fits snugly into the mailbox. 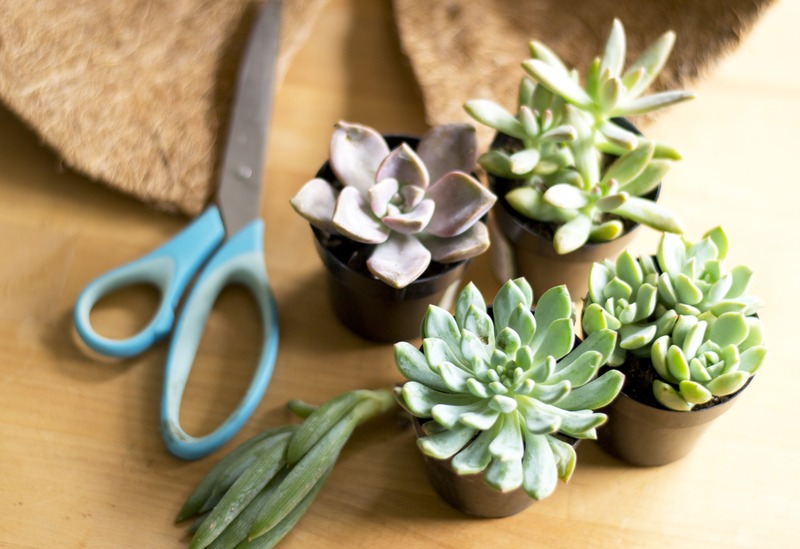 You’ll need to trim and cut a little flap in the front to allow the succulents to spill out. 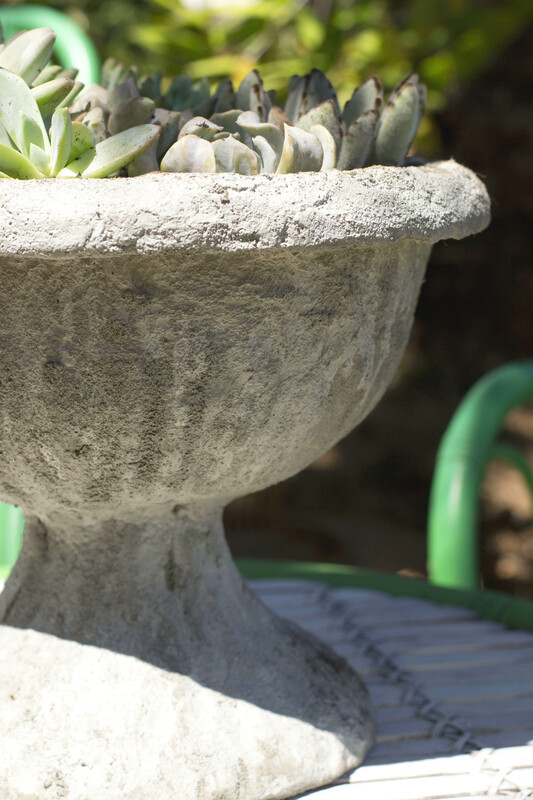 Add a potting mix made specifically for cactus and succulents. 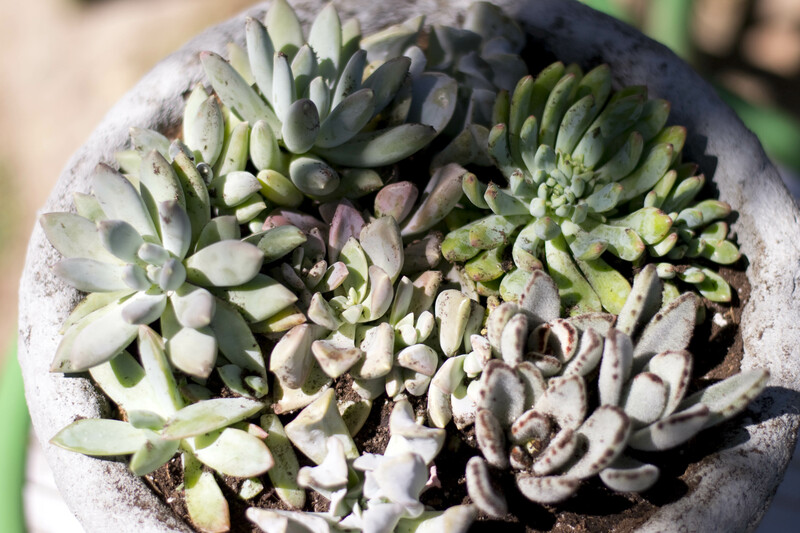 Once the liner is in place, pack in as much soil as you can and insert small succulents to form a pretty bouquet. Water when the soil becomes dry to the touch. Give it a whirl! My petite beach cottage is blessed with a compact outdoor garden. With not many green square inches to work with, I managed to turn a vintage bike into a slim standing planter, and now it’s time to take advantage of the little porch. Summer is winding down, and it was the perfect opportunity to grow up and maximize the vertical green space. A solid wood lattice railing borders the porch, which inspired my first try at an espalier climbing vine. 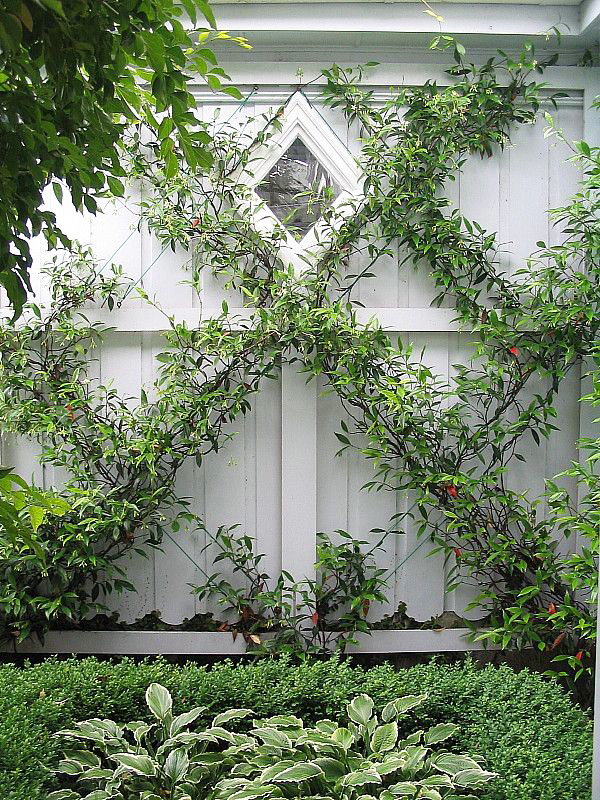 Espalier is an old-world method of pruning and tying live plant branches flat to a wall or lattice to create a pattern. I decided to plant confederate jasmine for my espalier design since it grows pretty quickly in partial shade, and the fragrance is oh, so sweet. Thread galvanized wire through eye screws (Everbilt #210) and install a crisscross patterned frame for the jasmine to cling to. I planted the jasmine two days ago so it will take a little time to prune and guide the vines into full shape. But the basic steps for creating an espalier are relatively easy, inexpensive and a lot of fun. So far, no casualties. If space is limited in your neck of the woods, give espalier a try. This vine training video boosted my confidence and made me feel like the basic espalier techniques could be mastered without too much risk or frustration. I’ll be updating its progress on instagram: living_in_a_nutshell. Once the espalier frame is fully covered, it can camouflage an ugly fence and give you a little extra privacy where needed. 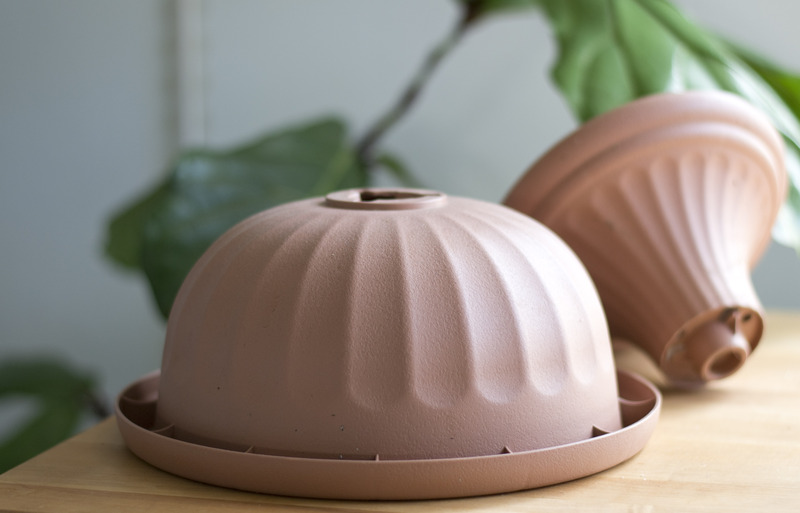 Cement planters give any petite garden or terrace a touch of cool modern, but the $100 and up price tag motivated me to take design matters into my own hands. 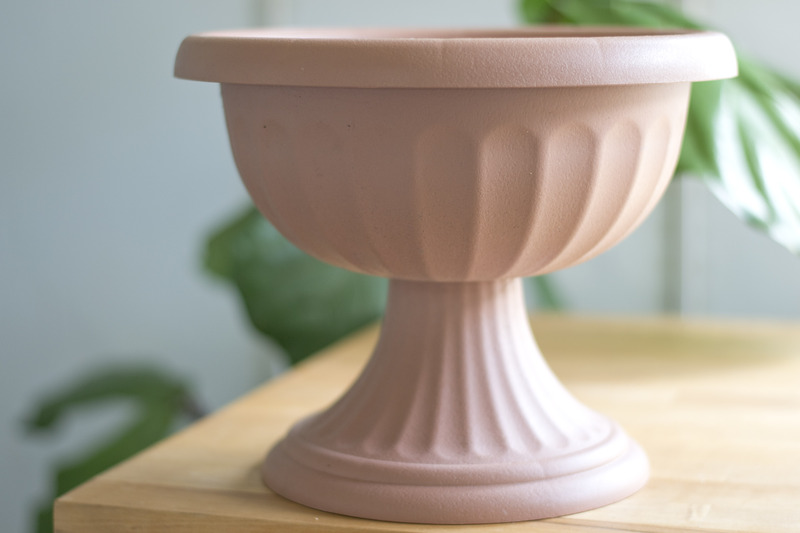 On a recent visit to my favorite Japanese dollar store, Daiso, I bought a plastic planter urn. I drilled a few extra drainage holes to prevent soggy plant roots later on. Now, for the fun part! I had a little bit of Shapecrete left over from a previous project, which is a mold-able concrete mix that works like clay. You just add water. It comes in a large 20-lb size, but you will be surprised how many projects you can create with it. Make sure and use gloves. I do not have allergy-sensitive skin, but working with this clay with my bare hands made them feel itchy for a few hours. 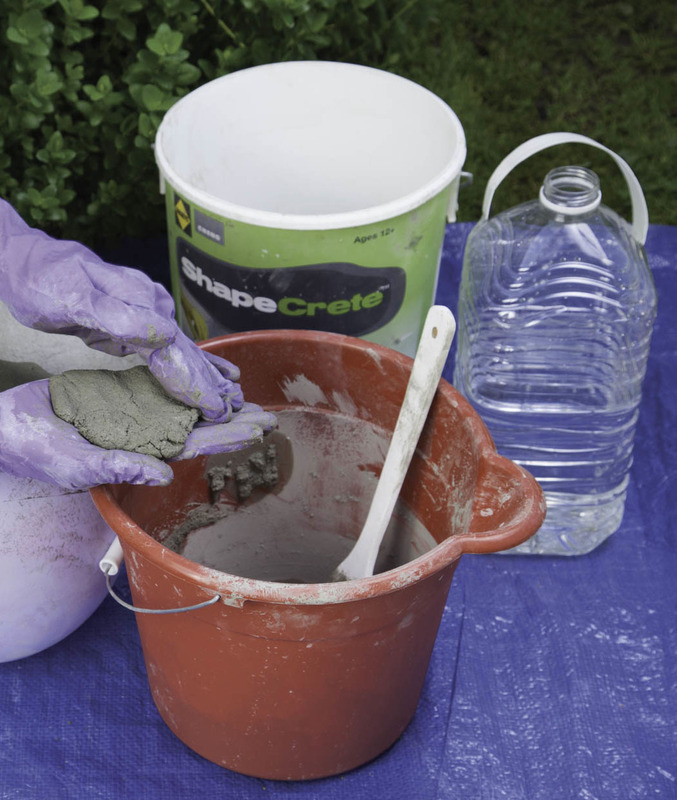 Check out Shapecrete’s how-to video here. Drape and shape the clay over the outside of the urn and just over the top lip, leaving the inside of the urn uncovered. According to Shapecrete’s website, their product will alter the pH of the soil which may or may not affect some plants. Being a card-carrying brown thumb gardener, I didn’t want to risk it. Instead, I lined the inside with a coco liner and added the soil on top. Living in sunny California, succulents have truly become my friend. 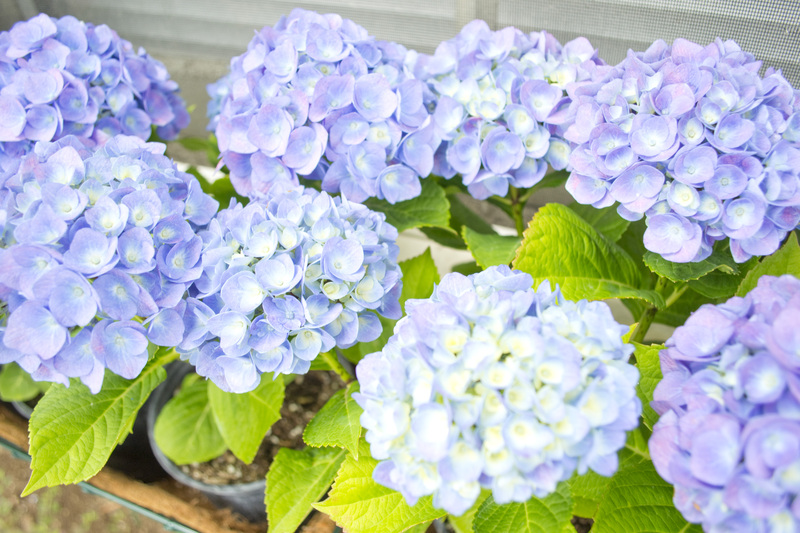 They’re drought-friendly and so easy to grow in almost any container even an old postal box. My succulents look happy and are thriving in their new home. Be sure not to overwater. Entertaining in a small space is one of the ways to extol the virtues of living large and proud in tight quarters. 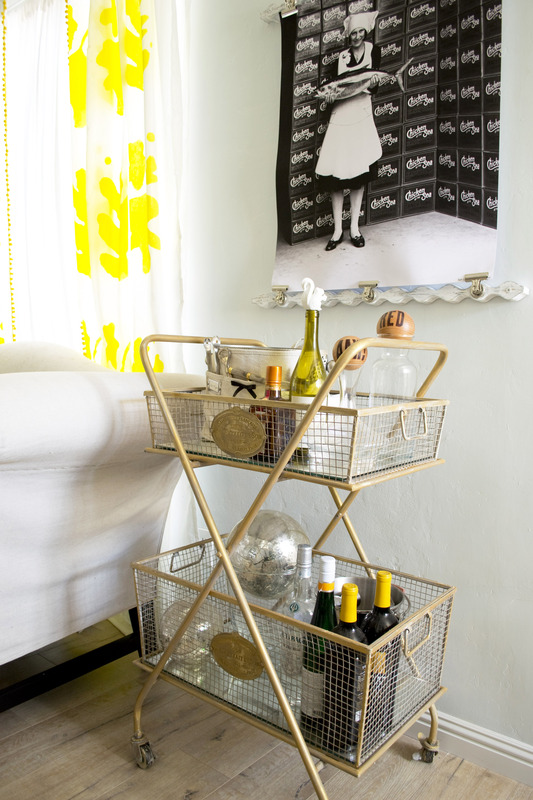 A mini-cart on wheels is an adaptable small space staple that I’ve come to rely on in each of my dinky digs. I’ve even been known to put a portable fireplace on wheels in a studio. Being able to move things around makes you feel less beholden and cramped in a niche. This former laundry cart now stands in seamlessly as a portable bar and beverage station in my quaint living room. In such tight quarters, the cart also doubles as an end table. 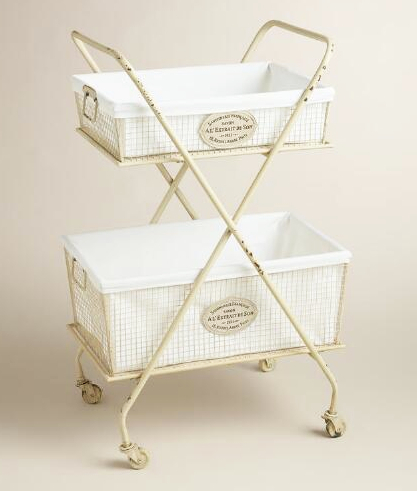 This bar-to-go is particularly handy when it is wheeled outside for impromptu garden cocktail parties and the baskets can be removed for easy cleaning. Keeping the original, distressed white paint finish reminded me too much of its former days as a laundry basket. Layer it with gold gilding wax to give it a much needed hint of Hollywood Regency shimmer on a shoestring. Ice buckets and stemware can now be stored out in the open freeing up precious kitchen cabinet and counter space. 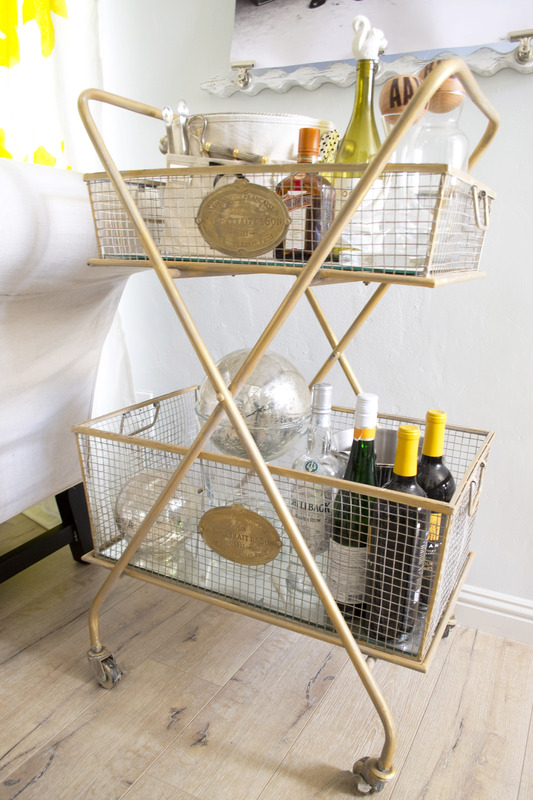 The standing bar cart also establishes a visual separation between the living room and the dining nook, preventing what I call, “shoebox syndrome.” With established zones, a petite abode breathes and moves more like a grander, well-appointed home. Give it a whirl! For years of not having a garden space in NYC, I couldn’t wait to install a window box onto my petite beach cottage. 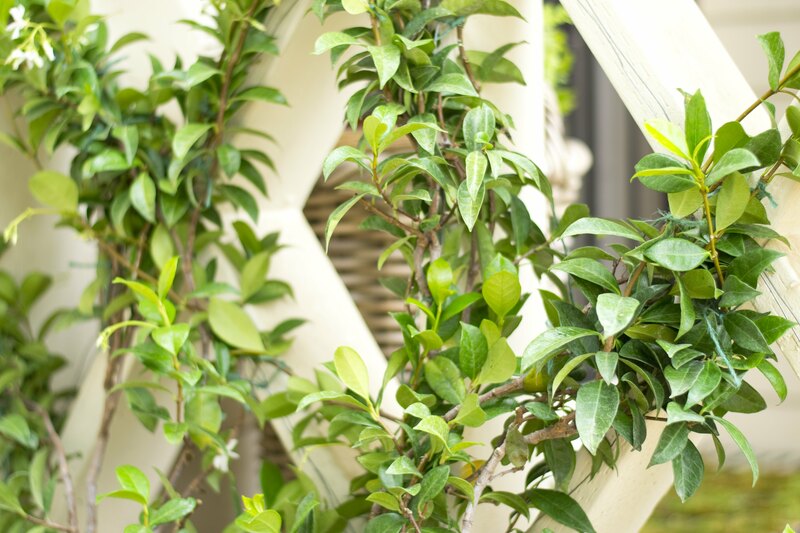 The house is blessed with a small garden in the front with plenty of vertical garden space to play with. 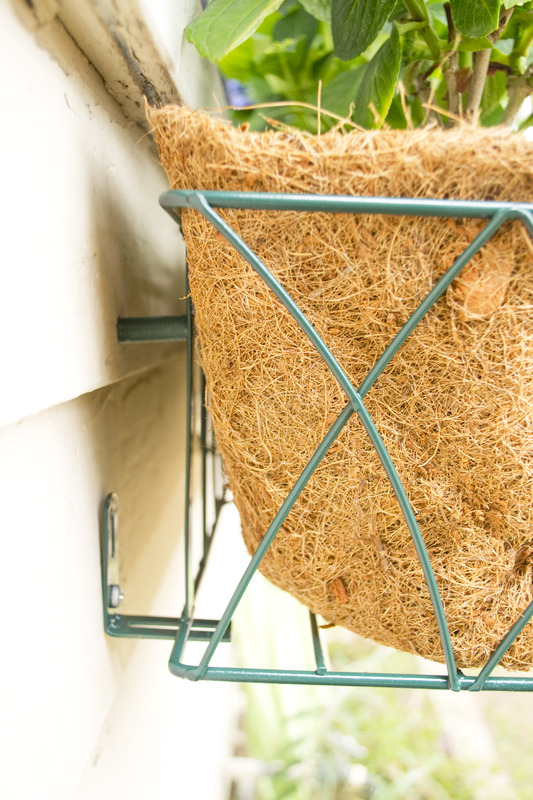 I love the look of a wire basket with a coco- liner and because it is light and durable, the window box would be easy for me to install by myself. I am also a big proponent of flexible design, and this installation leaves very small holes behind if you want to take flower boxes with you. I bought black wire window boxes from Home Depot and since they only had the 24″-size in stock, I installed two boxes side by side to fit the width of my window. A smaller window box would shrink the look of the house front. I painted the flower boxes hunter green to match the shutters on the house. 1. 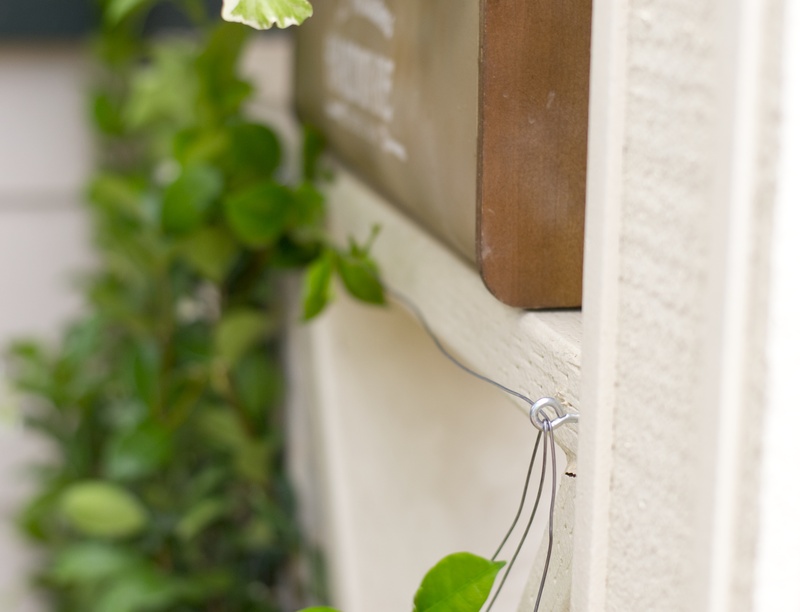 Look out for flower box brackets that hold boxes at least an inch away from the house. If not, buy 1-inch metal spacers. These will keep the window box from touching the house exterior and will help prevent water damage and moisture build up behind the box. For a little camouflage, these spacers were painted green to match the box. 2. Use 4-inch deck screws. Use a level to measure and mark your holes onto the house. I wanted the window box to be about 1-1/2″ below the window sill but that is a matter of preference. Make sure and use a small drill bit to make a pilot hole first. Don’t skip this step or you might split the wood on the house. Place screw through the back of the window box through the metal spacer and into the house exterior. 3. 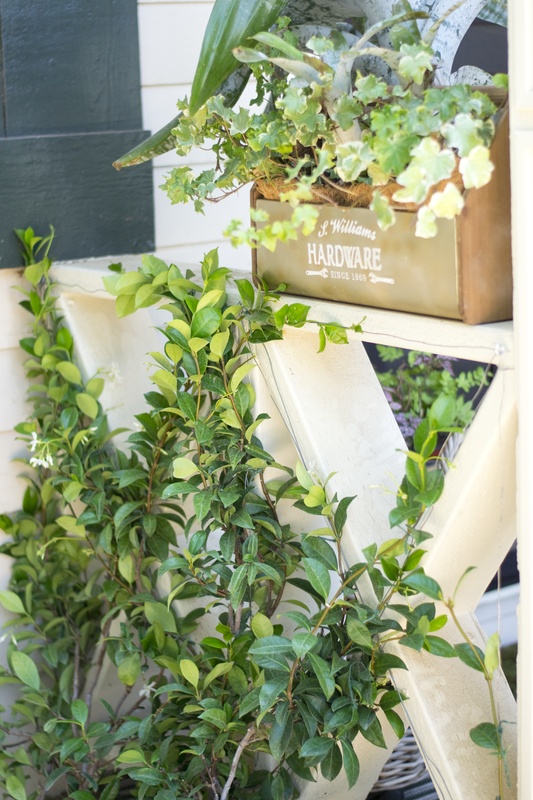 Use two planter box brackets per 24″-wide box. You can also use drapery rod brackets like I did, which were left over from a previous project. They are also a little cheaper. 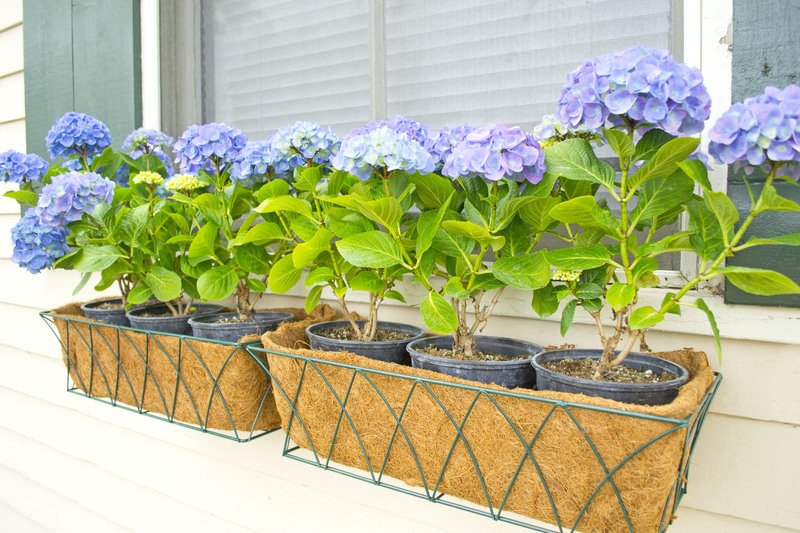 The weight of the soil in your window box will get very heavy with water and rain and these wire boxes need extra support from sagging. To get an accurate measurement for the brackets, I screwed the window box in first, made my marks for the brackets, then unscrewed the deck screws halfway, enough to lift the box out of the way to screw the brackets in. Then I tightened up the top screws. For the brackets I used 2-1/2″-size deck screws. 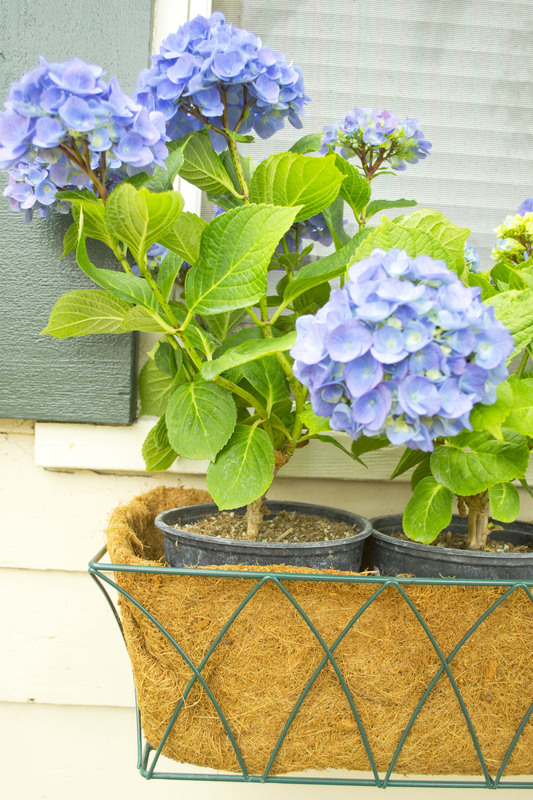 Because I am a garden newbie, I opted to keep the hydrangeas in their containers instead of planting them in the box, in case they experience an untimely demise. This way I can do a quick swap out any time in the season. Not blessed with a green thumb? Join the club. I had no idea how to approach the design of my newly-acquired petite garden. When I moved in the grass was dead and buried, one fruit tree was hanging on for dear life, and only the weeds were winning. The garden needed a design feature in the front that made a statement without taking up a lot of space. I scanned Craigslist and found a used Schwinn bicycle that mimicked the lines of more classic models of the past. I swapped out the ugly black racing seat with a vintage green and white Schwinn saddle. I found that on ebay for $25. 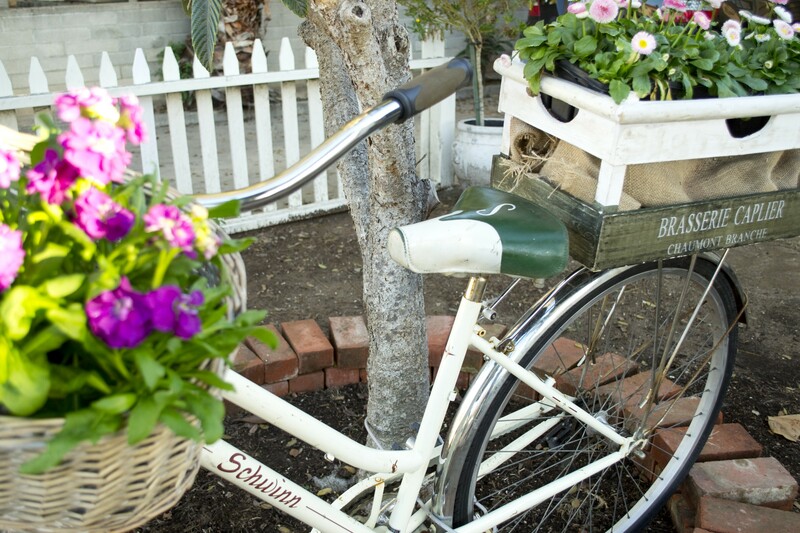 Look out for a bike with a back rack for extra plant display potential. A wine crate I bought at Home Goods last year is strapped onto the back rack for an ideal spot to showcase potted flowers. I live in a high traffic area so I locked the bike to the tree and stripped all of the gears off to make it less appealing to sticky fingers. I balanced the risk of theft with the amount of money spent and I think I have come out ahead on this project. 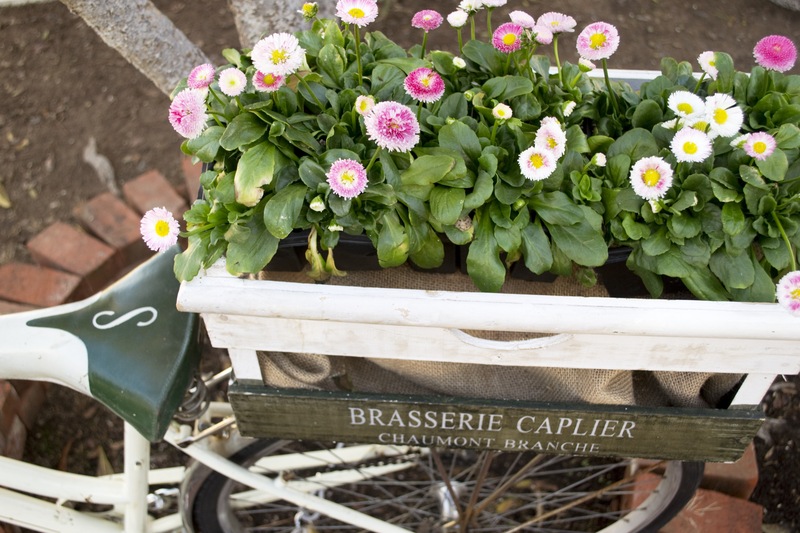 This flower crate bicycle gives my cottage instant curb appeal! I’m not going to lie. The renovation of my beach shack into a sweet cottage is moving at a snail’s pace. But sometimes you just have to surrender to the design gods and be patient. 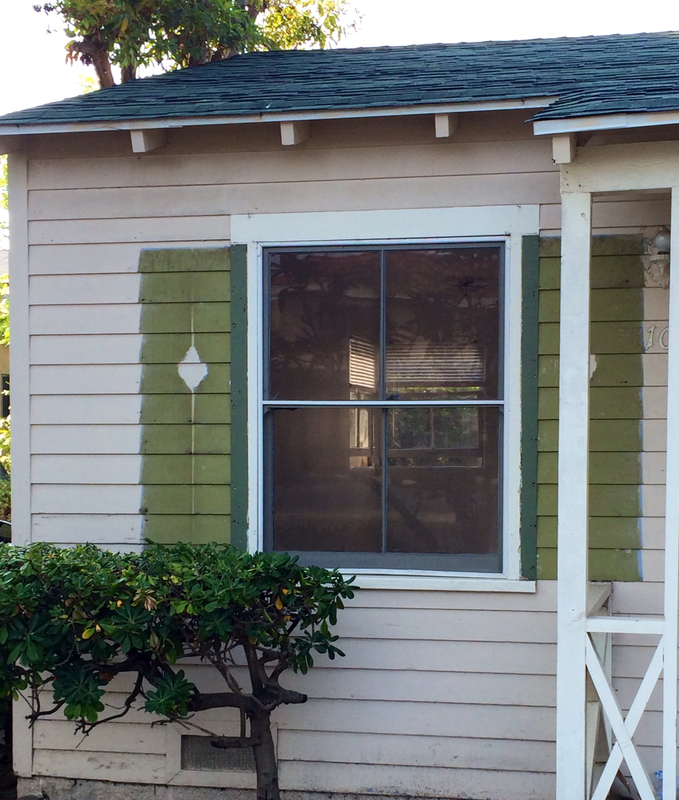 The original shutters were removed from the house and by the look of the color imprint left behind, the shutters were once a grass green. I stripped the old paint off myself and it took several days. There were so many old layers of paint to remove. It was not a pleasant project, but I am happy with the final results. Use a less caustic paint remover like Citri-Strip available at most hardware stores. 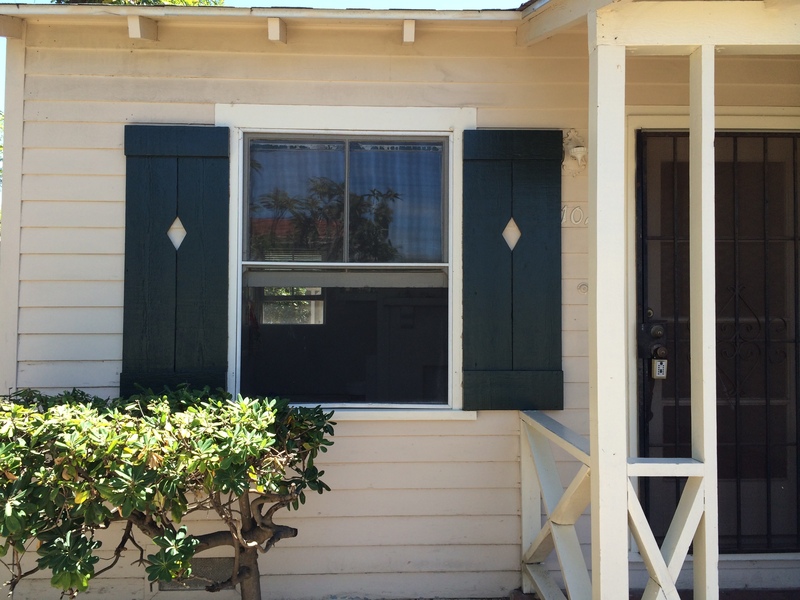 Benjamin Moore’s Essex Green was the number one paint choice for the shutters. 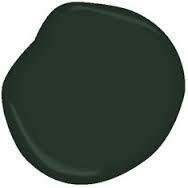 It’s a very dark Hunter green, which gives this cottage a bit of architectural detail it desperately needs. 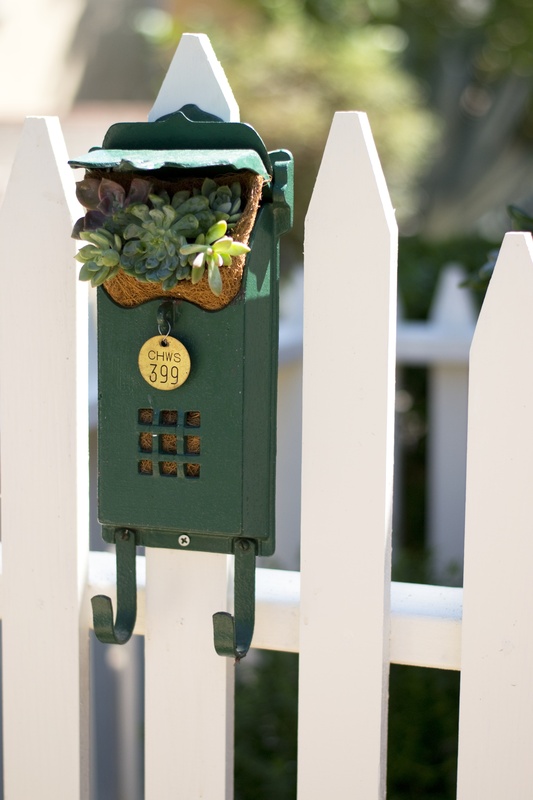 For added curb appeal, I fell in love with this metal address plaque from etsy.com. It’s designed by a company called LandDelements. It is easy on the budget at $30, and I feel good about supporting an independent craftsperson.